The N.C. Chronicles. 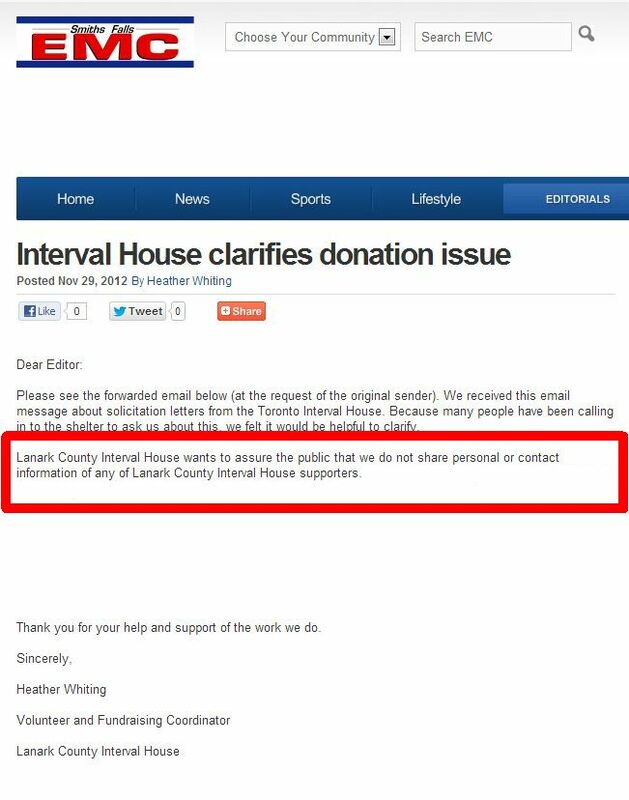 : Calls for an investigation of Lanark county interval house finances. Calls for an investigation of Lanark county interval house finances. 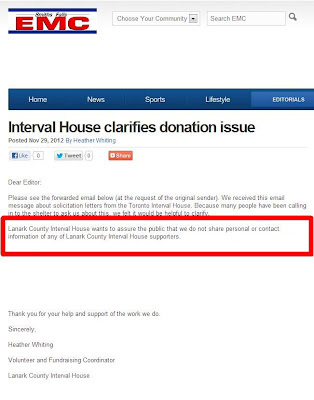 "Lanark County Interval House wants to assure the public that we do not share personal or contact information of any of Lanark County Interval House supporters." I see names and personal contacts of supporters here.....lol...and this is "not" the only ones, there is names of personal contact information practically every week in this..."newspaper".. 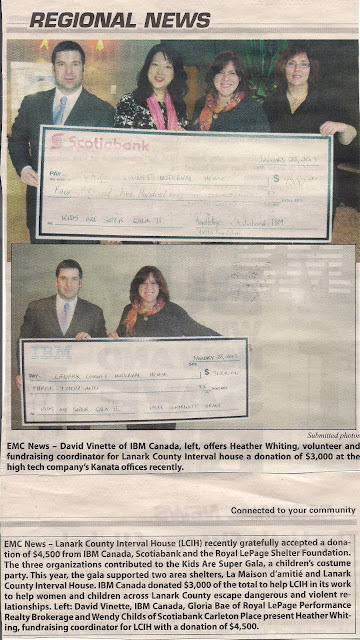 Since I am the only "viable opposition" media outlet of Lanark county, it is important to see the other side of the story. To expose what is truth and what is propaganda. The other story I would like to point out is, this shelter gets a considerable amount of funds from governments, provincial and local, businesses and personal, they even got an infusion of money from the regional government recently. I exposed their little game a while back, they asked for money, saying they were broke, when the regionals told them everyone is in financial difficulty and they could not help, they and the local media made them look bad by saying they did not care about women and children, did not take long after that for the local governments to freak out and give they $35,000. That said, practically every week, the local media has a story about donations to this shelter, thousands of dollars. Question? Where is all this money going? How can they be broke when they get donations every week, and support from businesses, personal, local, provincial and federal...??? I call on governments, even the tax man, to investigate, have an assessment of this shelter, to tell us exactly where the money is going, the salaries of its staff and their personal expenditure promoting themselves. This is a very small shelter, the cost to run it, is not that extensive, if a "man" was running it, it would be more financially responsible, if there where male workers, they could show and explain to the victims of domestic violence that not all men are the same, promoting the reality that what happened to them was the act of an "individual" instead of "all men bad". only make victims believe they will be victims all of their lives, but then that is what they aim for, this way that person believes she will be victimized for the rest of her life and can be added to next years statistics. I do believe that if there were male examples, male workers in shelters, it would integrate the strength back into these victims, that men, as a whole are understanding and caring. But since they only have workers who have brought their hatred with them, how does this make them "experts" and how does this help a victim get her strength back when she is blasted with messages that can only be described as one sided. In closing, the women's shelter program has become an industry, and their policy is to get as much money as possible at the expense of the victims, to accept any story, whether it is true or not, invites false statement in order to get on the top of the emergency list, quick custody against fathers, or just simply...revenge. All these issue wastes funds, better used to help victims, and that is why I am calling for an investigation of the financials goings on at this shelter. What are they really doing with all the donations and funds they get practically every week.